Rob Bell and Come Ledogar took the 2016 Blancpain GT Endurance Cup title, despite suffering a drive-through penalty and not scoring a point in the season finale at the Nurburgring on Sunday. The one silver lining of their non-scoring performance in the final race of the year is that Shane van Gisbergen, absent from this race due to V8 Supercars commitments, takes the title with them as he finishes the season on the same points total. Of the trio’s championship challengers, the #84 HTP Mercedes came closest to overtaking their points total, but finished just one place behind where they needed to score sufficient points. As for the other two contenders, the #8 Bentley came home 14th having run in the top 10 for much of the race, while the #99 ROWE BMW of Catsburg, Sims and Eng finished 10th after starting 39th. 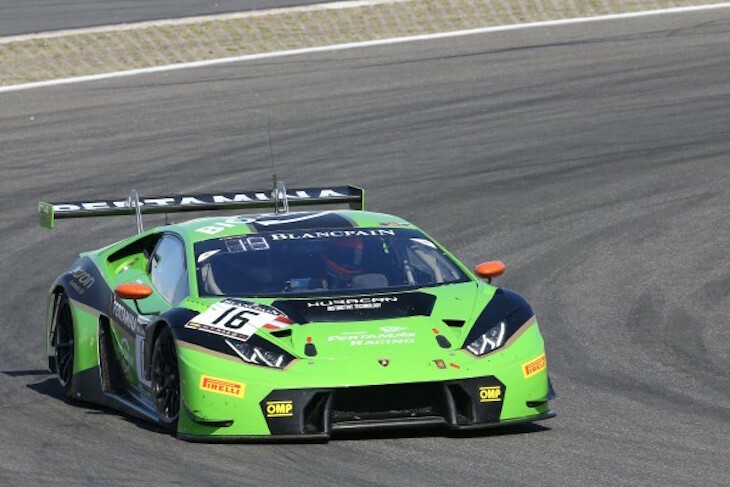 The race was won by Christian Engelhart (making his Blancpain GT debut and standing in for regular driver Jeroen Bleekemolen), Rolf Ineichen and Mirko Bortolotti in the #16 GRT Lamborghini, with Engelhart holding off big pressure from Laurens Vanthoor in the #1 Audi in the closing stages. 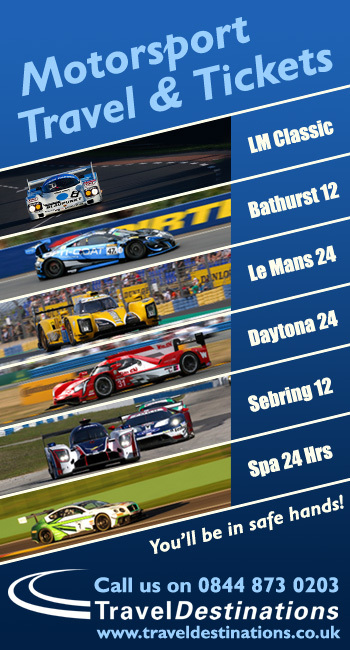 The podium was completed by Alex Buncombe, Mitsunori Takaboshi and Lucas Ordonez in the #23 Nissan. Daniel Keilwitz and Alexander Matschull drove as a duo to take the Pro-Am Cu win while the Am Cup race victory went to Gilles Vannelet, Maurice Ricci, and Jean-Luc Beaubelique in the #87 AKKA-ASP Mercedes. Pro-Am Cup champions are Kessel Racing’s Michal Broniszewski, Alessandro Bonacini and Andrea Rizzoli in the #11 Ferrari 488, having finished second in the standings for the past two seasons. Season honours in the Am Cup also went the way of the Kessel Racing trio: Marco Zanuttini, Vadim Gitlin and Liam Talbot in the #888 Ferrari 458. Polesitter Luca Stolz in the #19 GRT Lamborghini held his lead on the first lap, but his team-mate Mirko Bortolotti in the #16 found his way up to second from fifth on the grid, later passing to take the lead. The start of the start, though, was Fred Vervisch in the #1 Audi, vaulting from 14th to fifth on the frantic opening lap. There was a coming-together between Duncan Cameron in the seventh-place qualifying #52 AF Corse Ferrari and Ahmad Al-Harthy in the #44 Oman Aston Martin going around the first corner, but both cars were able to rejoin – albeit well down the order. Andrew Watson’s race in the #59 McLaren then ended at turn four, when in the first-lap melee he ran wide onto grass, losing the back end of the car and veering into the barrier. There was a slight delay before the safety car was despatched to cover clearing up the debris from Watson’s crash, but it came in at the end of lap four. Lucas Ordonez had a good couple of opening laps in the #23 Nissan, getting up to fourth by lap 10 behind the two Lamborghinis and Vervisch. The latter had gained another two places after Will Stevens in the #28 WRT Audi pitted with a gearbox oil leak, while title contender Dominik Baumann in the #84 Mercedes seemed to be taking a circumspect view of things at this early part of the race and dropped to fifth. Further down the top 10, Pro-Am leader Daniel Keilwitz was also on the move in the Black Pearl Ferrari, getting into seventh behind Hubert Haupt’s #57 Black Falcon Mercedes. Title contender Maxime Soulet was eighth in the #8 Bentley, ahead of Pasin Lathouras in the #50 Ferrari, who’d dropped back from the car’s third place on the grid. Elsewhere, Rob Bell made contact with Marco Bonanomi’s #25 Sainteloc Audi at the hairpin on lap 12, sending the latter into a spin and elevating the #58 McLaren into 13th place. At the front of the field, Vervisch still had the bit between his teeth, outdragging Stolz down the start-finish straight to move into second at the beginning of lap 14. Bortolotti was now over eight seconds up the road in the lead. Meanwhile, Bell made contact again, this time with Daniel Zampieri’s #101 Lamborghini while battling for 12th. The black-and-white driving standards flag was shown to the McLaren and an investigation into the contact with Bonanomi (who was himself handed a drive-through for overtaking under yellows) was opened. Another title contender in the wars was fifth-place Baumann, who nearly tagged the spinning #53 Ferrari of Motoaki on lap 19, but both cars kept going. Bell’s next move, meanwhile, was a clean pass of Lathouras on the approach to the chicane, taking the McLaren to within a place of the top 10. Haupt then lost two places in quick succession, with Keilwitz advancing to sixth and Soulet to seventh. Vervisch meanwhile had managed to chip into Bortolotti’s lead slightly as the first hour wound down, with Stolz, Ordonez and Baumann holding station in fourth, fifth and sixth. Another position lost by the fading Haupt saw Luca Ludwig into eighth in the Zakspeed Mercedes, with Frank Stippler in the #75 ISR Audi completing the top 10 just before the one-hour mark. Around the same time, Bell was given a drive-through penalty by the stewards for causing the collision with Bonanomi, minutes before the car would have made its first scheduled stop. 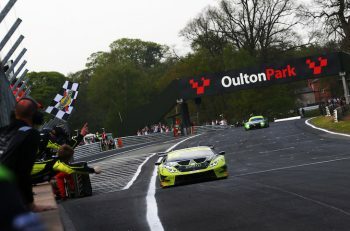 Once all the front-runners had stopped, the #16 Lamborghini had retained the lead, now with Rolf Ineichen at the wheel. Dries Vanthoor was second in the #1 Audi, while Mitsunori Takaboshi emerged in third after a close dice with Michele Beretta in the #19 Lamborghini when both their cars emerged from the pits together. Title contender Jazeman Jaafar came out fifth in the #84 Mercedes and was hot on the heels of Beretta when the message came through that the title-contending #8 Bentley (now being driven by Wolfgang Reip) was under investigation for its first pit stop. The #58 McLaren meanwhile, was running just inside the top 20 in the hands of Duncan Tappy after Bell’s drive-through just before the stops. Jaafar squeezed through on the inside of Beretta through turn three to get into fourth early on lap 37, while Tappy made up two places early in his stint to reach 18th. Alexander Matschull was now aboard the Pro-Am Cup-leading Black Pearl Ferrari and initially ran sixth in the stint, but he and Reip were both passed by Michele Rugolo in the #50 AF Corse Ferrari started by Lathouras. Reip then came under pressure from Andreas Simonsen, who’d taken over the #57 Black Falcon Mercedes from Haupt, whole Tappy’s work in getting the McLaren to 18th was then undone when he came together with the #85 Mercedes of Luciano Bacheta as it exited the pits. Tappy spun but got going again, however he then had to make an unscheduled stop as the contact had caused a right-rear puncture, dropping the car to 37th. Rugolo’s progress saw him get past Beretta to take fifth with 15 minutes of the second hour remaining, while Alexander Sims had the title-contending #99 ROWE BMW into 12th, the car having started 39th in the hands of Philipp Eng. Just ahead of Sims was 11th-place Vincent Abril in the #7 Bentley. The car had been started from the pitlane by Guy Smith, but didn’t have to take a drive-through penalty in the end, as the M-Sport mechanics had managed to salvage the engine from the chassis crashed in free practice. Reip – who it later transpired was driving with one old tyre after the left-rear wheel refused to budge during the car’s first pitstop – dropped positions to both Simonsen and Nikolaj Rogivue’s Mercedes-AMGs, followed by Abril in the sister #7 Bentley. The whole train was becoming increasingly held up by seventh-place Matschull in the Black Pearl Ferrari, but Rogivue would be removed from contention when the Zakspeed car was given a drive-through for contact earlier in the race. 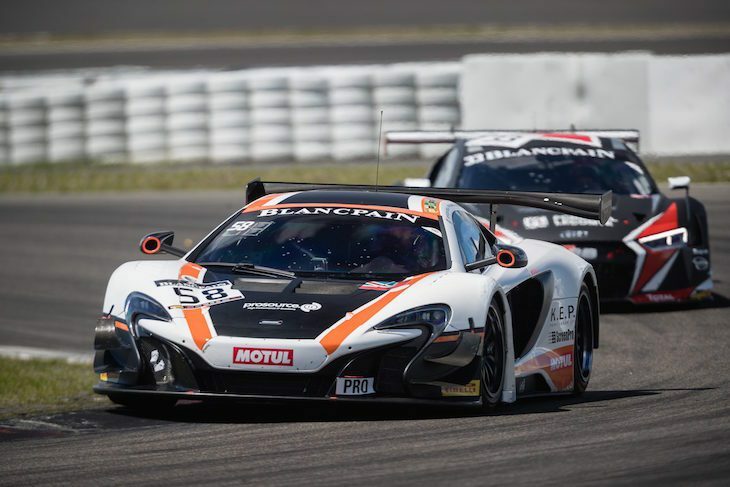 Ineichen, Dries Vanthoor and Takaboshi had very uneventful stints at the front of the field, although Vanthoor was within 2.1 seconds of the lead as the second hour came to a close and the second round of pit stops got underway. A heavy shunt at the hairpin for Louis Machiels in the #100 Attempto Lamborghini brought out a full-course yellow just as the last few of the third round of pit stops were being completed. The FCY then became a full Safety Car period as the marshals set to work rebuilding the tyre wall demolished by Machiels. As the field circulated slowly, Christian Engelhart was now aboard the leading #16 Lamborghini, ahead of Laurens Vanthoor in the #1 Audi and Alex Buncombe in the #23 Nissan. Max Buhk had taken over the fourth-place #84 HTP Mercedes and he’d have to catch and pass Buncombe to clinch the title for himself, Jaafar and Baumann. Matschull aboard the Black Pearl Ferrari, which was back up to fifth having completed its pit stop under the FCY. Alessandro Pier Guidi began the stint in sixth in the #50 Ferrari, Andrea Piccini was seventh in the #19 Lamborghini, while the eighth and ninth-place #74 ISR Audi and #114 Emil Frey Jaguar had also benefitted from the FCY covering their pit visits. Adam Christodoulou in the #57 Mercedes completed the top 10 under the safety car, which stayed out until there were just over 30 minutes of the race remaining. Buncombe managed to put a couple of lapped cars between himself and Buhk on the restart, giving the German even more work to do to take the championship. Up front Vanthoor harried Engelhart closely for several laps, but they were both being gained on by Buncombe, who closed to within three seconds of the lead in the final minutes. 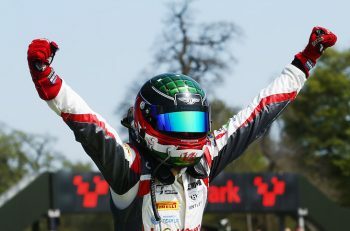 Despite continued pressure from Vanthoor, Engelhart held on to take the chequered flag first, with Buncombe coming home ahead of Buhk to deny the HTP crew the title and Matschull holding on for a very impressive fifth overall and Pro-Am victory for the Rinaldi Racing-run Black Pearl Ferrari. Piccini brought the polesitting #19 Lamborghini home sixth, ahead of Hirschi in the #114 Jaguar, while a late charge by Robin Frijns in the #2 WRT Audi saw that elevated to eighth, ahead of the #7 Bentley and #99 BMW, which rounded out the top 10. Pier Guidi dropped out of the top 10 in the closing stages with an apparent mechanical problem, while the #8 Bentley also lost a number of places towards the end of the race when Andy Soucek spun on oil and had to make an additional pit stop to compensate for the stuck wheel at the car’s first stop.